The family loan agreement is a document that is made between relation by blood or marriage with one (1) acting as borrower and the other a lender. The family member that is asking for the money may be required to pay an interest rate, defined as a percent compounded annually, by the lending party. If so, the lender will be paid back more money than what was originally lent to the borrower. Although, usually funds loaned between family members are not charged an interest rate but depends on the family relationship. 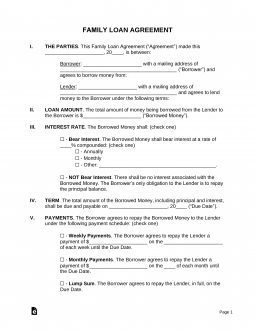 A family loan agreement shares the same basic elements with other lending contracts. It should specify a repayment term and payment schedule, an interest rate, and other contingencies, such as how late payments or a default will be handled. Like any other legal contract, this agreement should include full names and addresses for both parties – and specify their relationship – and should be dated, signed, and witnessed by at least two others. Notarizing your agreement is also recommended. What is the reason for needing the loan? Is this person honest and do they have a history of repaying debts? It’s advised to give the upmost attention to detail when lending money to family. If the family member does not pose any red flags after asking yourself these questions, the next thing to do is obtain their credit score and credit report. Assuming that they are asking for a loan from a family member, it’s suspected that their credit report might be subpar. Often times, if you have the money to burn, it’s better to gift the money or not give it at all. A troubled borrower, a family member in this case, is likely to default and a personal fallout could be a result. Use your intuition before deciding to give the loan. Payment schedule – Details how the loan will be paid back, usually once per week or once per month on a specified date. If neither of those payment options (weekly or monthly) work for you, you can specify the type of pay back option. Interest – Interest on this loan will be compounded annually. The interest rate can not be more than the allowed usury rate in the borrower’s state. The usury rate is the maximum percentage you are allowed to charge under state law. Considering this is a family loan, be easy and give a low interest loan. Repayment – Because this is a family loan, this agreement allows the borrower to easily pay back the loan at anytime. Unlike normal loans where there is a penalty for repaying the loan early, this agreement does not contain such language. Expenses – If the borrower goes into default, they will be responsible for paying all attorneys’ fees and interest incurred. Sit down in the presence of two witnesses when coming to terms on the agreement. Try to find two witnesses that are unrelated to the family. In the event of a dispute, you would not want the witnesses to be in conflict. After all signatures are signed, write out a check to the borrower or send an electronic transfer online. Do not give cash. For the lender’s sake, you want maximum protection and by doing that means having the transfer of money documented. While there is clear wisdom in setting a repayment schedule, the idea of taking interest from a relative clashes with the very familial impulse that may have motivated the loan in the first place. Doesn’t family exist outside of the domains of the marketplace, capitalism, and profit? Somewhat surprisingly, interest on family loans may be best thought of as a necessary evil. First, there’s the issue of fairness: by advancing a sum of money to another person, the lender-family member is forgoing potential interest earnings. This is the opportunity cost of making a loan. Charging interest offsets this loss. How much potential income is lost by making a loan to a family member? While current bank interest rates are near historic lows, the somewhat-riskier stock market has yielded big returns for investors large and small. What’s more? Investing in the markets is often less risky than extending credit to a son or cousin. Though you may not recoup all foregone investment income, charging some interest is fair. The more critical issue involves taxes. If you make an interest-free loan above the IRS gift threshold – currently set at $14,000 – you will incur tax liabilities. Setting an interest rate above the modest “Applicable Federal Rate” or AFR that is dictated by the government prevents this. Though states also set statutory maximums on interest that can be charged on loans, these anti-usury limits are irrelevant in most family-lending situations. Often, borrowers turn to family after being refused by traditional lenders. This means that they are on shaky financial ground, with some combination of spotty credit and insufficient earnings. Though family loans are often used for pragmatic, and even edifying purposes – to finance education, consolidate debt, or purchase a first home – it is important to remember that abstaining from the formal credit system can reinforce existing credit issues. Since a family loan often occurs off-the-books of the formal financial system, the good faith process of regular repayment does not build the borrower’s credit history as it would with an official loan. As a compromise solution, family can enlist the support of a third-party processor to facilitate repayment and report results to the credit bureaus. There are several competing online services, including the popular Loanback.com. Though taking a formal loan can mean being subjected to considerable vetting, borrowing from family is not necessarily any simpler. Often, the choice to take a family loan means trading one kind of complication for another. You do not have to worry about hurting the bank’s feelings or alienating its loan officers – but the same can certainly not be said for a family loan. In general, the best course is to imitate the formal process, absent the administrative layers that can prolong and complicate bank transactions. Though borrowing from a family member may be the only option for less-creditworthy borrows, the end goal is usually to repair credit and finances so that future borrowing occurs in the formal sector. While family finance may be a good stop-gap solution, it is unlikely to be the best long-term solution.